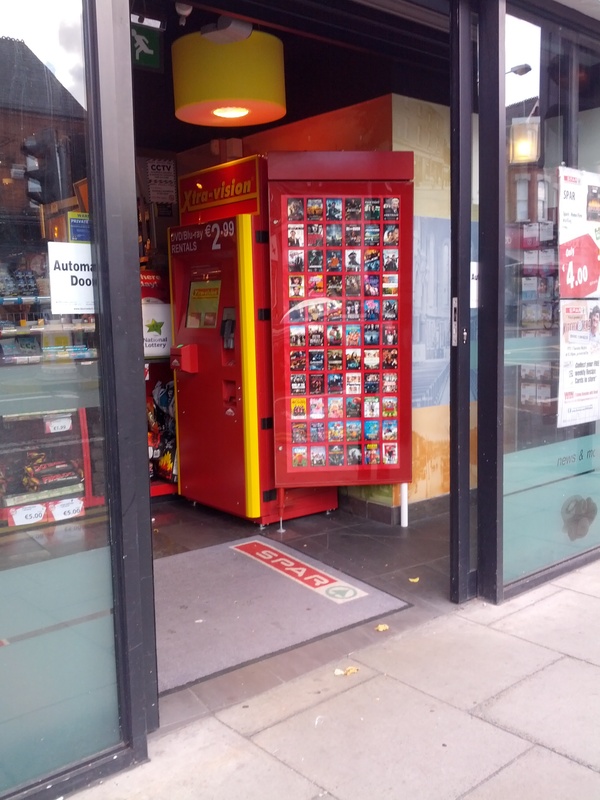 Xtra-vision have rolled out DVD and game rental vending-machine kiosks throughout Dublin. The concept was created by the UK company Hilco, which recently took over Xtra-vision and HMV. The vending machines will function very much like the company “Redbox” in the United States and Canada. The kiosks offer over 300 rentals, with new releases added every friday. Users do not require an xtra-vision card as the machines run using debit or credit cards. Prior to the rental a debit or credit card is read, upon returning the rental the card is swiped again and the payment is charged based on number of rentals and duration. Rentals cost €2.99. An additional fee of €1.50 is charged per day the rental is not returned. However if the rental is not returned within 10 days the charges halt and the rental is considered purchased. One of the first kiosks in Dublin has popped up in Spar on Ranelagh Road, Ranelagh village. Ranelagh resident Thereseanne McCormack said, “I think it’s a good idea, but a novelty idea. “Currently it only has one screen to work from, I think it would be better if more than one person could use it at a time. “Although considering the Baggot Street and Rathmines xtra-vision shops have recently closed it is good to have the option available again,” Thereseanne concluded. Other Spar and Eurospar outlets supplying the new vending-machines include; Sandymount, North Circular Road, Inchicore, Kilmainham, Ellis Quay, Monkstown. The kiosk is the first initiative introduced by Hilco to boost sale revenues since they bought the chain earlier this year. Another initiative is integrated Xtra-vision and HMV stores which have opened in Artane and Ashleaf.